My favorite Foreign Service Journal issue of the year is out! All the recently published books by writers affiliated with America’s proud diplomatic corps are listed in one tight package this month. Pick up a few titles and learn about the Foreign Service. Read about how we promote U.S. interests and protect our citizens overseas. Support our diplomats by reading their accounts. From biography and history to policy and memoir, the November issue covers dozens of important topics by writers steeped in their subjects. My favorites usually appear under the fiction banner. 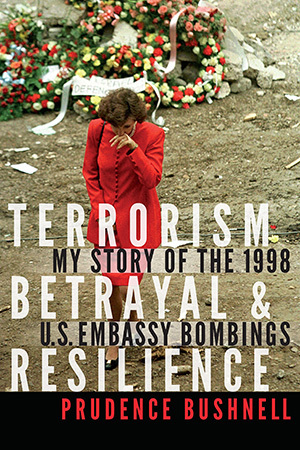 I hope to feature several titles at BenEastBooks throughout the month, but I could start nowhere other than with Ambassador Prudence Bushnell’s Terrorism, Betrayal, & Resilience: My Story of the 1998 U.S. Embassy Bombings. The story feels personal to me, not only as a survivor of a terrorist attack against the diplomatic compound where I worked in Saudi Arabia. It’s personal because I remember the emotion Ambassador Bushnell shared with us during a course at the Foreign Service Institute so many years ago. I relate to her story well and remember sharply where I was when I learned that our Embassies in Tanzania and Kenya had been hit by al Qaeda. I read about the events in Harare, where my brother had just departed after we traveled together during my Peace Corps service in Malawi. I remember marveling at the stroke of fortune that prompted us to travel west to Zimbabwe rather than north to Dar es Salaam that week. Stories like Ambassador Bushnell’s, and so many others, serve as a reality check on what it means to serve in the diplomatic corps. This book sounds amazing! I didn’t remember that you were in Africa during the 1998 terrorist attacks. I definitely remember hearing the horrible news when the compound where you worked was attacked in Saudi Arabia. Horrifying. Your work is meaningful and important. Thank you!